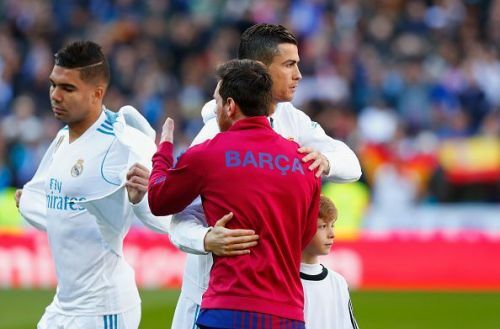 Paris Saint-Germain star Kylian Mbappe has revealed that he can't choose between Barcelona ace Lionel Messi and Juventus star Cristiano Ronaldo, with the Frenchman jokingly adding that he would rather bench himself and pick both of them to play for his team. Messi has been in spectacular form this season, with the Argentine netting a brace against Manchester United to fire Barcelona to the semi-finals of the Champions League last night. Messi has thus far scored 45 goals in all competitions for Barcelona in the present campaign. Ronaldo, on the other hand, saw his Juventus side crash out of Europe's elite competition after succumbing to a 2-1 defeat at the hands of Ajax in the second leg of their quarter-final fixture on Tuesday night. The Dutch outfit secured a 3-2 aggregate win to book their place in the semi-finals of the Champions League. Mbappe is having a stellar campaign himself, having thus far scored 33 goals in just 39 appearances in all competitions for PSG this season. The forward, who helped France to World Cup glory last summer, has often been referred to as the heir to Messi and Ronaldo. "If I had to choose between Messi and Ronaldo in my team? "I would bench myself so both could play." Barcelona, who are aiming to win a treble this season, will face either Liverpool or Porto in the next stages of the Champions League, while Juventus have to be satisfied with only the Serie A title. Cristiano Ronaldo Or Lionel Messi?